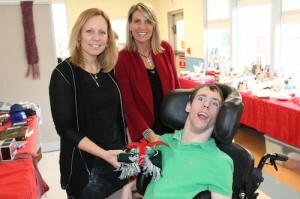 From left, adult services instructor Jodi Miguel, Friend of Matheny Andrea Szott and Matheny resident Aaron Turovlin. The Friends of Matheny raises money throughout the year to provide Matheny’s students and patients with extras that enhance their quality of life. For example, during the holiday season, The Friends’ Holiday Boutique makes it easier for them to buy presents for family members. The Boutique, set up in the children’s dining room on December 8, gave Matheny’s students and patients an opportunity to shop for good, inexpensive holiday gifts. It was stocked with items from The Friends’ Second Chance thrift shop, and, for very reasonable prices, the patients and students could purchase gifts and have them wrapped. Since its inception in 1983, The Friends of Matheny has raised more than $3 million to support Matheny’s programs and services. 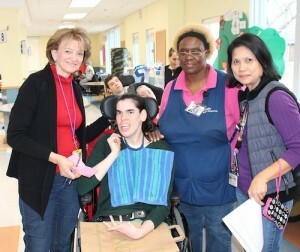 From left, Friend of Matheny Helen Fallone, Matheny resident Lauren Nelson, personal care assistant Claudett Brown and adult services instructor Imelda Schroeder. This entry was posted in Uncategorized and tagged Friends of Matheny, Holiday Boutique. Second Chance thrift shop. Bookmark the permalink.